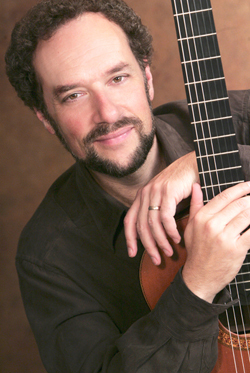 William Kanengiser, founding member of the Grammy Awared–winning Los Angeles Guitar Quartet, will conduct a masterclass for the New York City Classical Guitar Society. Participants will include the New York City Guitar Orchestra and three individual performers. NYCCGS Member Events are free and open to all members and first-time guests, and are supported by a generous grant from the D’Addario Music Foundation. Recognized as one of America’s finest classical guitarists, William Kanengiser won First Prize in the 1987 Concert Artists Guild International Competition as well as major guitar competitions in Toronto (1981) and Paris (1983). He has recorded four solo CDs for the GSP label, ranging from classical to jazz to Caribbean to Near Eastern styles, and he recently recorded two CDs for the Suzuki Guitar Advanced Repertoire Series. In 2005 he released a live concert DVD, Classical Guitar and Beyond, for Mel Bay Recordings, which also features his talents as a comedian/mimic in his infamous “GFA Imitation Show.” A member of the guitar faculty at the USC Thornton School of Music since 1983, he was a recipient of the 2011 Dean’s Award for Excellence in Teaching. He has given masterclasses around the world and produced two instructional videos, Effortless Classical Guitar and Classical Guitar Mastery for Hot Licks Video. The 2010-11 season was marked by special performances of Shingo Fujii’s Concierto de Los Angeles for solo guitar and guitar orchestra, which was written for Mr. Kanengiser and recorded in Kyoto in 2008. This piece was played with guitar students in seven US cities, including New York, as well as in Osaka and Shanghai. Featured recitals in 2012-13 include Spivey Hall near Atlanta and appearances with the Long Island, Philadelphia, Sacramento, Calgary and Indianapolis Guitar Socities. As a founding member of the Los Angeles Guitar Quartet, Mr. Kanengiser has toured extensively throughout Asia, Europe and North America and recorded over a dozen CDs. LAGQ was awarded a Grammy for Best Classical Crossover Recording in 2004. Their newest recording project Interchange, features concertos by Joaquin Rodrigo and Sergio Assad; it was released in March 2010 and received a Latin Grammy nomination for Best Classical Composition. In addition to three European tours this season, they recently completed their Australian debut tour, including three sold-out shows at the Sydney Opera House. In addition to the many arrangements and compositions Mr. Kanengiser has written for LAGQ over the years, he recently created the stage production The Ingenious Don Quixote: Words and Music from the Time of Cervantes, writing a one-hour script for John Cleese (of Monty Python) and arranging accompanying Spanish Renaissance music for guitar quartet. This work is now being toured with comedian Phil Proctor of the Firesign Theater, and was recently released as a live DVD on Mel Bay Recordings.